I first posted about London-based artist Slinkachu's "Little People" project back in 2008. Since then he's added many more installations and published a book of collected photographs - Little People in the City: The Street Art of Slinkachu (Macmillan UK, June 2009), available through Amazon. The book features 53 scenes, some never before shown on the internet. Since 2006 Slinkachu has been painting tiny model train set figures and leaving them in random places. Originally just in London, he has expanded to other parts of the UK and other countries such as Holland, Norway, Italy, and Greece. You never know where you might find them - on street corners, in alleyways and potted plants, even on pieces of trash. It is both a street art installation project and a photography project. "The street-based side of my work plays with the notion of surprise and I aim to encourage city-dwellers to be more aware of their surroundings. The scenes I set up, more evident through the photography, and the titles I give these scenes aim to reflect the loneliness and melancholy of living in a big city, almost being lost and overwhelmed. But underneath this, there is always some humour. 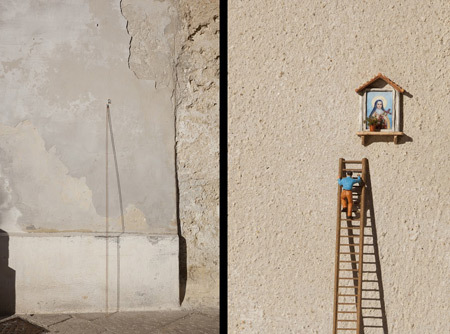 I want people to be able to empathise with the tiny people in my works," Slinkachu says. The artist has begun another project as well, "Inner City Snail: a slow-moving street art project," decorating the shells of live snails and then setting them free to go about their business. He describes this project as "a satire of street art and, more generally, our need to cover every available surface of our cities with graffiti, signage and advertising." To see more of these amazing and hilarious works, visit Slinkachu's Little People blog and Inner City Snail blog. My bro introduced me to slinkachu when I 1st started mini :). He's been an inspiration since. Love that quirky sense of humour and will get that book! Very ,very Spectacular!!! Love it!! I bought this book online last week after I saw this post. It arrived today and it is a great book! I love it! Cool, Lori! I just got to see some of Slinkachu's photos (and the book) last week. Had no idea they'd be there, just popped into a gallery that was having a street art show, came around a corner, and there they were! Even cooler life-size and in person. His work makes me want to start leaving things in arbitrary places.